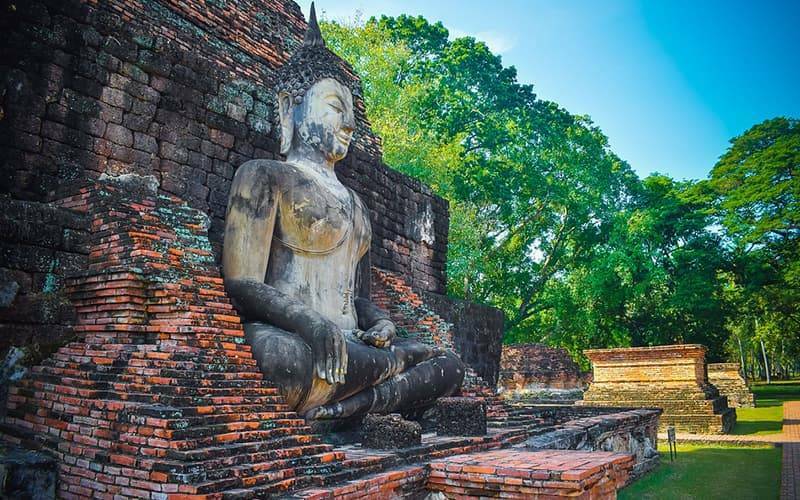 Sukhothai is a central city in Thailand and also the home to the first ancient capital in Thailand. 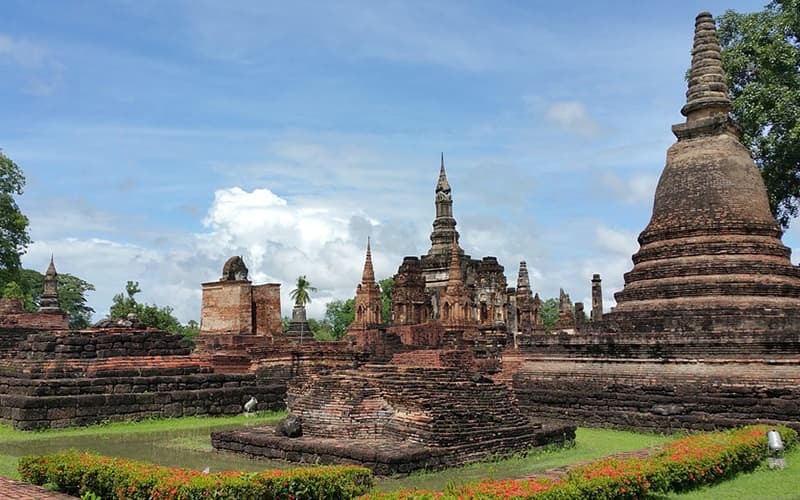 For those who love culture and history, Sukhothai is a must-visit for them, and we are encouraging anybody coming into Thailand to add Sukhothai to their itinerary. However, getting to Sukhothai is not that easy, because it is a little bit off the first railway lines. The only available option is the use of buses. Private trips and transfers could be all that relay you need. 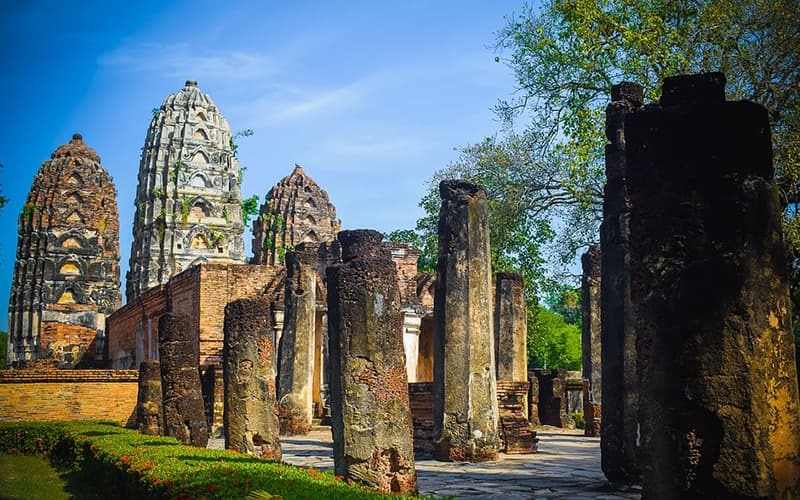 Information on Sukhothai visit, exploring the UNESCO listed Sukhothai Historical Park, where to stay, touring by bike, golf buggy and every other thing you need to organise a trip Sukhothai is right here for you! Read on! By Air: the Bangkok Airways currently serves Sukhothai Airport from Bangkok Suvarnabhumi Airport, with two flights on a daily basis starting from 2,290 baht (1 hour 15 minutes). A shuttle is available from the airport directly to your hotel. By Train: Take the (express) train (7 hours from Bangkok or Chiang Mai) to Phitsanulok then, join a bus from there for another 1-hour journey to your destination. By Bus: even though Sukhothai only has a small bus station, but you can still get to the city easily reached using buses from far and near. This is the principal point of attraction of the city. The park which opened in 1958 houses the ancient city of Sukhothai. As soon as you reach the ticket desk, you will be asked to pay 100 THB (per zone) for entry fee and another 150 THB for an audio guide (if you want). Should you decide to come up with a means of transport, say a scooter, you'll have to pay an additional 50 THB; or just 10 THB for a bike. The park is divided into 5 zones spread across a surface of more than 70 km2. The park opens daily from 8:30 a.m. to 4:30 p.m.
Of all these loveliest temples that you can visit in the central zone, one of them is at Wat Mahathat, a temple that serves as the ancient city's spiritual centre. The temple's name means the Temple of the Great Relic and its buildn9ng is seen as the custodian of some of the Buddha ruins. It is situated in such a way that it will be admirable for both the sunrise and sunset. After Wat Mahathat, Wat Phra Phai Luang is the second most important temple in Sukhothai, located outside the walls. It was built before the founding of Sukhothai and was decided on by King Jayavarman VII, head of the Khmer Empire. In fact, there's a strong resemblance between the architectural style of this monument and the Bayon Temple located inside the Angkor park, in Siem Reap, Cambodia, which was also designed by Jayavarman VII. Biking remains the most classic way to explore Sukhothai, and there are several places in the town where you can hire one. Your lodging service provider can even rent or loan you a bike. You can either choose to do a personal tour or arrange for a guide to take you around on a bicycle tour of the city. Due to the hot weather, go around with a sunshade, protective clothes and water although the distances are not that far most of the roads are very quiet. If you want to get the most out of any historic spot, we firmly recommend that you go for a guide. Explore the old city of Sukhothai with a tuk-tuk. Hire a sociable, honest and jovial tuk-tuk driver, and he will show around the town, including the strange animals and paths while he also explains the Thai culture in proper English. Make use of a tuk-tuk especially on warm days. If you have a budget, you have better to do a tailor-made tour which will control your budget while giving you the best & most suitable experience. All your requirements will be taken into account. You can see the following best-selling tour and get ideas for your Thailand tour. Then, contact our 1-1 travel consultant for a wonderful tailor-made tour! Worry-free and easy booking! If you are doing an excellent place to have a taste of Sukhothai delicacies, head to the Chopper Bar on Pravetnakorn Rd. ; a rooftop eatery and bar with excellent service, live acoustic guitar music, and Thai and Western menu. The price of the for the main course starts at 40 baht. Dream Café: this is another location that offers fantastic recipes. It is located downtown New Sukhothai in a delightful rural old Thai building; Dream Café serves up a good assortment of Thai and Western dishes. There are concentrating service, different music and attractive décor at this cafeteria. Fueng Far: The restaurant that mainly serves for dinner. It could also be a drinking place which you can enjoy sipping beer by the Yom River. The food is called "fish food," for Sukhothai local fish (pla) dishes, especially spicy dishes. Legendha Sukhothai resort is outstandingly designed and listed in Thai village setting to deliver a feel of Thailand's authentic atmosphere whereas Chedi Wat Chang Lom, the ancient temple in the ancient capital of Thailand lies behind our boutique hotel offering the friendly touch of historic milestone up-close. All bedrooms feature teakwood furniture, and generously ensuite facilities are meant to give you greatest comfort maximumly. Swimming pool with Jacuzzi heads and children pool is uniquely available in the salted state. The resort is located within a 45-minute drive from Sukhothai Airfield. Leelawadee Resort offers rooms with free Wi-Fi and free parking. The renowned tourist attraction, Wat Sapan Hin is just a minute drive from Leelawadee Resort while the Sukhothai historical Town is just 2-minute ride away. Each room at the is equipped with either fan or air conditioning unit, a TV set as well as en-suite bathroom with shower facilities. Also available is a 24-hr front desk service at the travel house. Guests can relish genuine Thai cuisine obtainable at the on-site cafeteria. The culture and enthusiasm of Sukhothai can be relished while coddling in the luxuries and safeties of this boarding-house. The guesthouse features commodious interiors, a terrace, and traditional ornamentation with all the rooms allowing the guests to take in and enjoy the natural beauty and satisfyingly cool atmosphere the city provides. In addition to its comfortable lodging, visitors can explore the neighboring environment with hikes or bike expeditions.